Liquid house hypnotics from Montreal's NAFF Recordings boss. If you’ve been keeping a close ear on happenings over here, our next guest will come as no surprise. Montrealer Francis Latreille aka Priori and his chilled out posse of producer friends had some sort of 2018, with the NAFF imprint he launched alongside housemate and fellow studio hand Adam Feingold aka Ex-Terrestrial already responsible for some of the freshest Canadian house music in recent memory. One of the sharpest ears in the game, Priori’s mixing prowess shapes the sound of the label, while his knack for lush pads, liquid acid lines and clever melodies never wavers, whether on display under his own name or in collaboration with talented hometown buddies the likes of Dust-e-1, Project Pablo, RAMZi, Ex-T and Edouard Le. Here he’s recorded a seriously killer mix full of spaced out cuts and had a chat about all things NAFF.. dive in! Hey Francis, what’s been happening? How’s winter over in Montreal treating you so far? Hey Myles! Thanks for having me. I find it easier to keep spirits up in the winter if I get away from the city, so I’ve been trying to do that as much as possible. Had some great time hiking and birdwatching over the holidays. I also just moved in to a new place with my partner so we’re slowly getting setup, trying to find toothpaste in a sea of boxes and such. 2018 felt like a real breakout year for you and the crew of Montreal producers you work with, with your new label NAFF (co-run with Adam Feingold) responsible for some of the best releases of the year in addition to a few fantastic EPs of your own. Talk us through how you and Adam got to working together, and how the concept for the label came about? Thanks for the kind words! After being friends for a long time, I moved in with Adam in January of 2017 and setup a small studio at Casa Di Ruffino. It was basically in a shed (with a really lush orange carpet) that you could access from the kitchen. Over the course of the next 10 months, we would be hit by a series of unfortunate events (including a flood and a superstitious landlord) that ultimately forced us to move. It also coincided with the city cracking down on a truly effervescent afterparty scene here in Montreal. Oddly enough, it was a very prolific era for us that led to the birth of NAFF. We simply saw it as a more uncompromising way of sharing the music we had done. I think it’s an honest representation of Adam and I’s personalities, and hopefully it will reflect how we evolve over time! 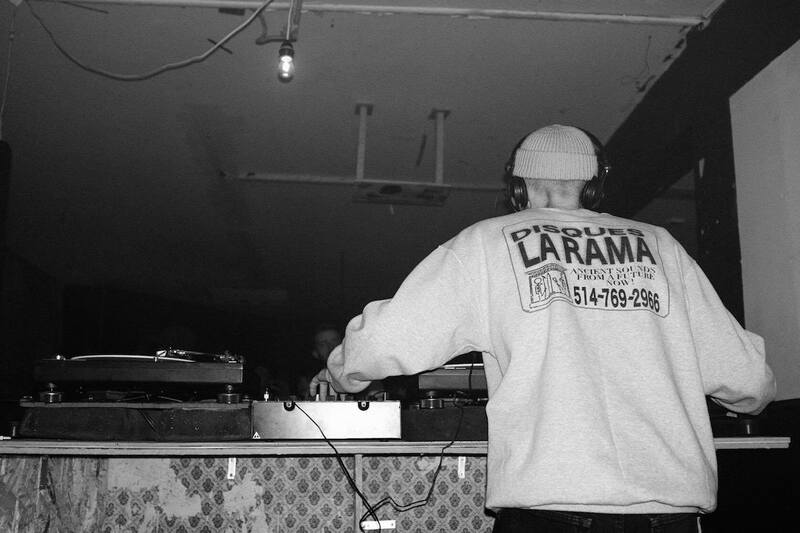 On top of the new label and your solo works you’ve been busy collaborating with a whole host of Montreal’s finest over the past year, releasing as Jump Source alongside Project Pablo, Housemates with Ex-Terrestrial, ANF with Dust-e-1, M.S.L. with Edouard Le and most recently Jumanjí with RAMZi. What have you enjoyed the most about working with such a broad range of artists? Have the creative processes been quite different from one project to the next? I think I really enjoy spending time in the studio with friends. I owe a lot to Patrick (Project Pablo) for reaching out to collaborate a while back. It has given me a lot of confidence and showed me how exciting writing music with friends could be. We now share a studio, where most recent collaborations happen. Everyone has a drastically different approach and I love that. I’d say every collab has made me a much better artist. I strongly recommend it! I know you’ve also been busy mixing all of the music for the label and played an important role in sculpting the sound of Perishing Thirst’s brilliant new LP, Pilgrims of the Rinde. Tell us about that project and how you went about working with the three artists involved to end up with the finished product..
Geezer Alex Sheaf aka Dust-e-1 came by the studio one day and showed me these weird spur-of-the-moment jams he had been recording with Markus and Cassie. It was such a compelling and sincere sound, so Adam and I proposed that they turn it into an album. We polished it together and recorded some extra bits, including the string section on ‘Poplar Object’. I feel really good about the album and it’s a pleasure to release music from such lovely folks. As a wise friend would put it: ‘’In a world of abundance, experience a Perishing Thirst’’. What can you tell us about this mix you’ve recorded for us? Any upcoming bits in there we should keep an eye on? It’s a mix of old and new, with some forthcoming bits by RAMZi, Ex-T, Ambien Baby and Jump Source, as well as a new solo thing. Some of that should be delivered via NAFF in the coming months. I know 2019 is already shaping up to be a big one for you, with the first Jumanjí album with RAMZi not too far away… What can you tell us about that record and what else you have coming up? The Jumanjí album should be out in the next few months. Working with Phoebe is amazing and I believe we’ve found our common voice on this one. We are simultaneously excited and irritated by a lot of the same things in life, socially and politically speaking. Somehow, I feel like this transpires through the music. Otherwise, there’s some new ANF music coming out shortly, an M.S.L. record, as well as a new Jump Source 12’’ that we’ll be self releasing. There’s a more leftfield band project coming out via Temple under the name New World Science. And maybe a Priori album. Also looking to get out of the studio this year to play some music!